I have been potting and sculpting clay for the last thirty years. I am equally challenged and gratified by the hand building process involved in the creation of ceramic pottery and sculpture. 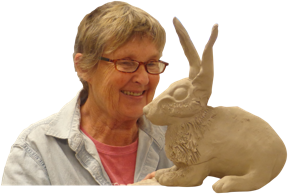 The creation of ceramic sculpture and pottery allows me the opportunity to transform an artistic vision into a three-dimensional statement in clay. During the last twenty years I have been sculpting animals, and of late, horses and ponies of all shapes, sizes and personalities. They have been created because I have a fondness, admiration and fascination for these great animals. Each horse enjoys an elevated status, and reveals a multiplicity of traits, rooted in historical tradition, realistic interpretation, and imagination. Depending on the type and character of each horse created, I decide which type of clay and firing technique will best suit the animal. I use red earthenware, porcelain, stoneware, and raku clay bodies. The clay is coiled for the horse’s body and the legs are either coiled or pinched by hand until the horse assumes the appropriate position. I continue to sculpt the horse until the true equine spirit emerges. Each large horse requires about forty hours to create. After the horse is built the burnishing process occurs. The surface of the clay is polished with a smooth stone at the leather-hard state until shiny. The sculpted horse is dried, fired, and then glazed. Firing techniques vary with the desired artistic outcomes. Red earthenware horses are fired in a sawdust reduction kiln. Porcelain horses are fired using either horsehair, raku or saggar firing techniques. Stoneware is fired using an oxidation kiln. And raku clay is fired in either a pit or in a raku kiln. On occasion, one of the ponies may be damaged during the firing process, and in such case, acrylic paint, a little glue and a warm heart may be used to reconstruct these “rescued Ponies”. Horsehair is usually applied for the mane and tail after the firing is completed. Each horse offers a special challenge, a new adventure, and is indeed one of a kind.